Embedded between Saturn's rings is a collection of mini-moons that NASA's Cassini spacecraft skimmed in 2017. On Thursday, astronomers and scientists explain their findings on the moons of the US journal Science. Pan, Daphnis, Atlas, Pandora and Epimetheus each measure between eight and 116km in diameter. They are either round, shaped like flying saucers or similar to potatoes. They are pinched in the holes that separate the planet's rings. 3, 2017, 20 years after its launch. About 4000 scientific articles have been published on Cassini's results, and the knowledge well is hardly daring. "I want to work for at least a decade on these things," said Bonnie Buratti, a planetary astronomer at the US spacecraft's Jet Propulsion Laboratory in California, to AFP. 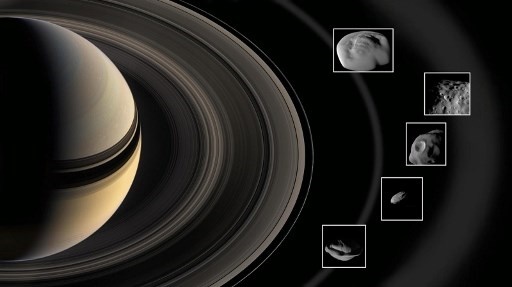 The data captured by Cassini's instruments is still being assessed. The survey published on Thursday is just an example of the discoveries that have yet to come. "The largest fragments became the core of these ring moon," Buratti, a 33-year-old NASA veteran, explained. "And what happened was the moons continued to accumulate particles from the rings – that's what we saw so closely, the accumulation of the ring material on the moon." This would explain the gaps left behind by the moons . More than three dozen co-authors from the United States, United Kingdom Germany and Italy worked on the study published on Thursday – a quite remarkable collaboration, according to Buratti. The question of astronomers is to find out how old the rings are. A study released in January based on Cassini data concluded that they were relatively young – somewhere between 100 million and one billion years old. But other models and methods suggest another answer.